Council Member Smith made the motion to approve the minutes of the June 15th, 2004 meeting and seconded by Council Member Armbrecht. Motion approved unanimously. Council Member Smith made the motion to approve the additional appropriation of $30,832 Fund # 595-49000-000-595 from Air Purifying Respirators Grant & $149,676 Fund # 593-43750-000-593 from Homeland Security Sub Grant for Equipment seconded by Council Member Dramann. Motion approved unanimously. Council Member Smith made the motion to approve the additional appropriation of $17,750 Fund # 425-36103-000-050 for Maintenance on Fair Ground Building/Park & Recreation and $250 Fund # 425-11355-000-050 for Stage Operators/Park & Recreation seconded by Council Member Armbrecht. Motion approved unanimously. Council Member Smith made the motion to approve the additional appropriation of $30,000 Fund # 585-49500-000-585 from Park Building Grant (Trustee’s Portion of matching grant) & $60,000 Fund # 585-49500-000-585 from Park Building Grant seconded by Council Member Simon. Motion approved by (6) Six members Bauer, Dunbar, Simon, Smith, Nickell & Dramann. Council member Armbrecht voted against. Highway Department additional appropriation’s for SISWD $7,000 Fund # 508-32761-000-052 & $500 Fund # 508-32764-000-052 was tabled until the August meeting. Council Member Armbrecht made the motion to approve the additional appropriation of $1,000 from County General/for Reward Riding Program Impressive Dogwood Horse Ranch seconded by Council Member Nickell. Motion approved unanimously. Council Member Armbrecht made the motion to approve the Salary Ordiance and Coordinator Proposition for the Public Health Coordinator/Environmental Health Specialist III (proposition until the grant is depleted) seconded by Council member Nickell. Motion approved unanimously. Council member Smith made the motion to the transfer of $1,800 from Fund # 331-34401-000-331 Environmental Telephone to Fund # 245-34401-000-037 seconded by Council Member Nickell. Motion approved unanimously. Council member Smith made the motion to approve the transfer of $3,678 from Fund # 331-32720-000-331 Master settlement/Registration & Conference Fees to Fund # 214-11150-000-034 Environmental Budget/Environmental Health Specialist (to raise the Environmental Health Specialist/Pat Thomas’s Salary for the remainder of 2004) seconded by Council Member Nickell. Motion approved by two (2) Members only. Smith/ Nickell. Five (5) Council members voted against the motion to give the Health Specialist a raise in Salary for 2004 (Dramann, Armbrecht, Simon, Bauer & Dunbar). Motion did not pass. Andrew Clark, Veterans’ Service Officer addressed the council with concerns about transportation of the Veterans to the city for treatment. Clark advised that he is in need of a van with a wheel chair ramp, for this service. Commissioner Reiners advised that he would look at applying for a grant for the purchase of a van for veteran’s service. Chelsa Dwenger/4H Corporation appeared in front of the council with concerns about the promotion of the Park Management Position and stated that Darla Westerfeld is doing a good job with the Fairground/Park in Osgood. Council recommended that she take her concerns to the park board. Craig Beckley/Heart house presented a budget for 2005 and asked that the council support the Heart house for 2005. Cecil Bultman, Rescue 69 Board member expressed concerns about the rising cost of fuel, insurance & billing for the units in Ripley County. Bultman asked for a 30% increase in compensation to help cover the cost for the remainder of 2004 & 2005 for all 4 units. Scott Melling, EMS Director addressed the issue of the billing for the units and updated the council on the process. Council member Simon made the motion to approve the GFC Contract seconded by Council member Nickell. Motion approved by six- (6) members Simon, Bauer, Dunbar, Nickell, Smith & Dramann and One (1) against Armbrecht. Auditor McCoy advised the council members that the budget meetings are set for Monday, Tuesday & Wednesday, August 30th, 31st & Sept. 1st, 2004. Public Hearing Meeting is @ 8:00AM on Monday, August 30th, 2004. Council member Smith made the motion to move the council meeting in September from the third Tuesday (Sept.21) to the seconded Tuesday (Sept. 14) (due to the budget adoption hearing for 2005) seconded by Council member Dramann. Motion approved unanimously. Southeastern Indiana Regional Planning Committee/Dephane Smith/ advised that Robert Reiners attended the meeting. 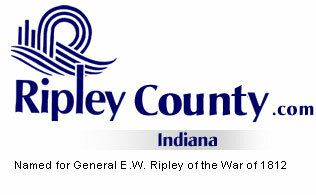 August 17th, 2004 @ 7:00 PM in the Ripley County Annex seconded by Council Member Dramann. Motion approved by Council Members present.